Winter and in particular Christmas walks can create some magical memories. Wrapping up, stealing yourself against the elements and setting off into the great outdoors. The seashore at this time year can provide some of the most dramatic and surprising experiences from storm-ravaged shorelines, bleak tree-lined estuaries or unexpected little sun traps with a flat calm sea to magnify the weak winter sunlight. 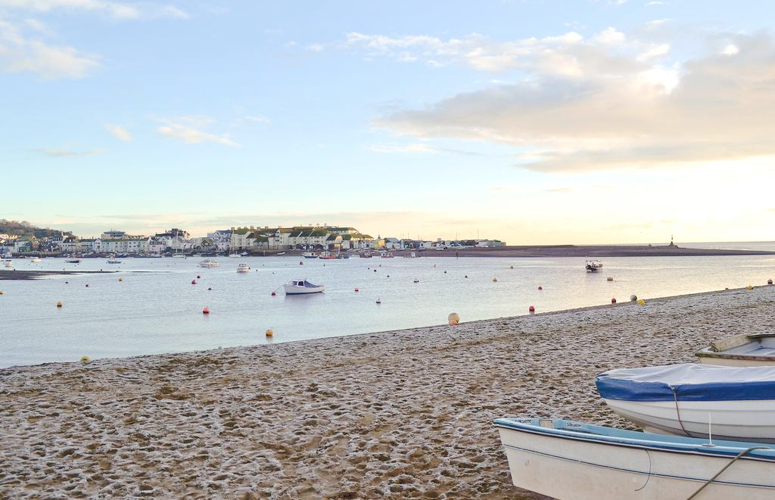 Devon is blessed with two fantastic coastlines proving miles and miles of cliffs, coves, harbours and beaches. These are my 4 favourite walks for this time of year along the South Devon coast that I know best. Starting from the unpromising surroundings of Brunel Industrial estate you follow the end of the Templar way under the A380 pick up the path that will take all the way to Shaldon. The ground is level and fairly easy going and if the tide is out you can walk along the shale and mud shoreline. The trees occasionally overhang the beach and dirt wood and the occasional remains of boats can be seen sticking out of the mud. You can see Abbotskerswell on the far bank and as you walk due east Teignmouth outskirts come into view. The path weaves back and forth around inlets for streams and more fallen trees. Walking east along the north facing bank means you are often in the shade and if the east wind is up you get the full effect of winter. Be sure to do this walk when the tide is out. Should you get it wrong threes every chance just as Coombe Cellars pub comes into view and is tantalisingly close you won’t be able to get there with getting very wet feet. Or so I am told. Start Point Car Park is easy to find on a map or via road signs from nearby Stokenham. Just follow the footpath downhill heading south. This route follows the south-facing part of the Devon coast and therefore gets the best of the sun, but also any of the prevailing south-westerly wind. 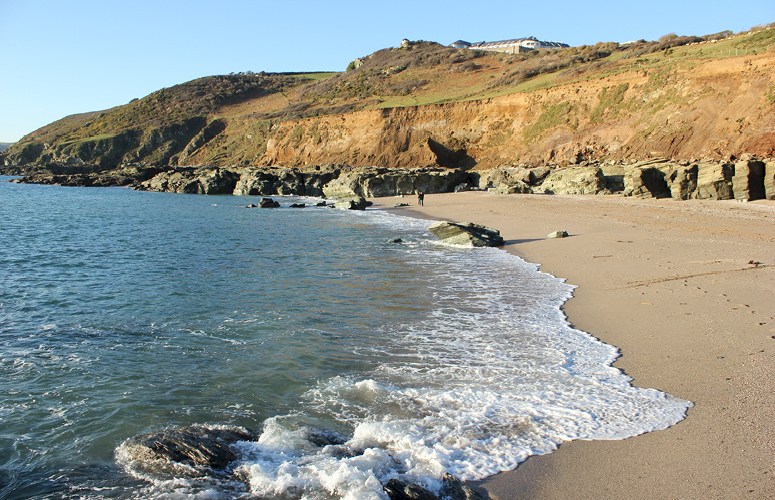 The cliff top paths give you great views across Lannacombe bay to East Prawle – the most southerly of our fair county and home to many shipwrecks. There are usually some signs pointing you down towards the beach, but if you head south down a steepish footpath you cannot really go wrong. The incline and condition of the path would be a challenge for those not steady on there feet. On most days the sea is clear enough to pick out the submerged rocks and white sand of the seabed stretching along the coast in both directions. The shoreline is great for snorkelling, although you need to keep an eye on the currents which can be strong in places. Grey seals are pretty common but can be hard to spot out of the water as they blend into the rocks. First of the three beaches will be at the bottom of the path and can be reached via scrabble of the rocks or via steep path depending on how the winter has treated the landscape. 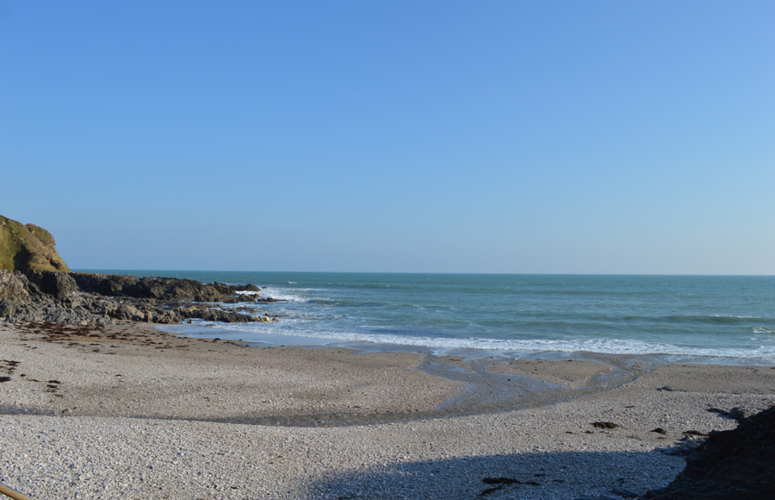 The beach itself is a mix of sand and rocks and will vary from one visit to the next, but there nelly always a good spot have a picnic on the sand and out of the wind. The walk along the coast path Lannacombe beach allows you to look down into the numerous gullies and ravines between the clumps of rocks. You may see a seal or someone snorkelling both likely to after the same things to eat. 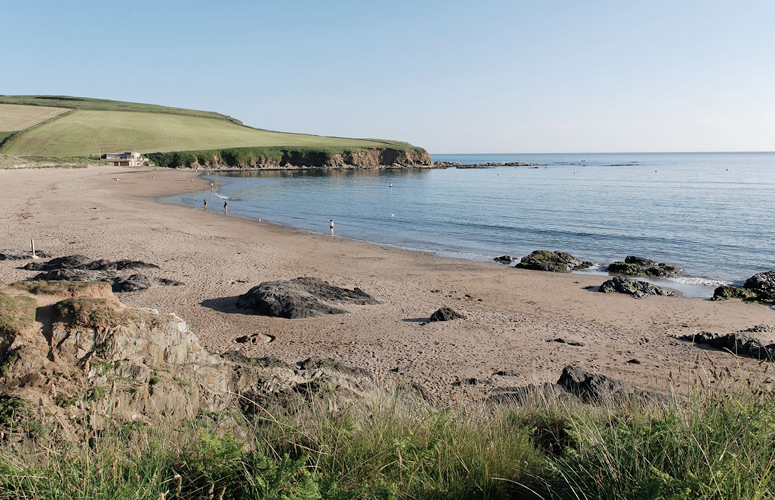 Lannacombe beach is a small stretch of sand at high tide that opens out into wide shoreline as the sea retreats. The tall rocks on either side provide good shelter and places to explore depending on your mood. Like Mattiscombe this is a real wild and unspoilt place with no commercial activity to speak of. The coastguard cottage has done B&B and cream teas in the past but I wouldn’t rely on it. There is a very rustic campsite here, but it is very inconspicuous and has lovely wild, old-fashioned Famous 5 feel to it. Garra Rock is a good – as in quite strenuous – walk from Lannacombe and will take up and down the coastal path. You will pass a few famous rock stars houses along this stretch of coast. I don’t know all of them, but one I am pretty sure you will pass here. It is not fair to name drop here, but she was a unique voice emerging in the late ’70s and there has no one like her since. Garra Rock beach is approached much ike Mattiscombe but this time white sand is everywhere and the beach shelves into deep clear water. The backdrop of the small steep cliff provides great shelter and traps the sun, making it a great place to have an evening picnic to watch the sunset. Located in Torquay facing due south again, this is where I learnt to swim as small boy with an obsession with Jacque Cousteau. This is a town beach where the local families come year after year and bring multiple generations. The beauty of this beach is it easy to get to and there is plenty of parking. Meaning when you need that quick fix of head clearing sea air or a swim this the place to go. There is a mile-long stretch of limestone seawall, with a coast road behind. 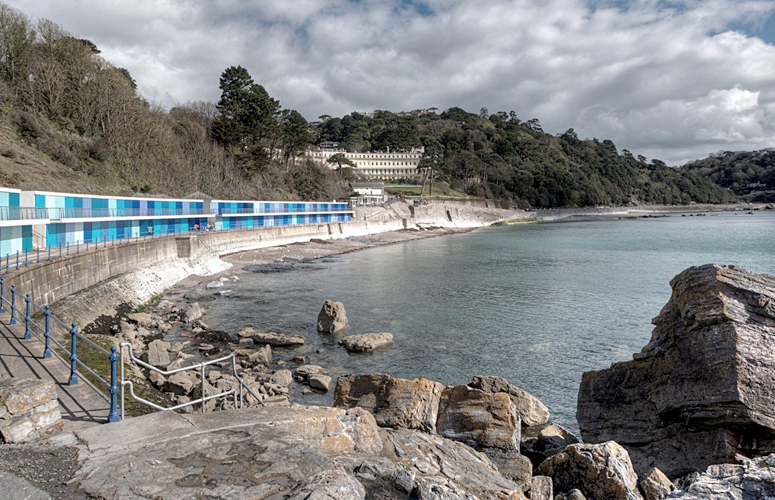 I am particularly fond of these massive structures that are a feature of the Torquay coast. The individual grey blocks stacked in a compound curve to deflect the storm waves. Each stone being weathered into a smooth blob. The massive walls soak up the suns heat and act is natural storage heaters in summer, ideal for warming up after ‘staying in’ just a bit longer than you should. 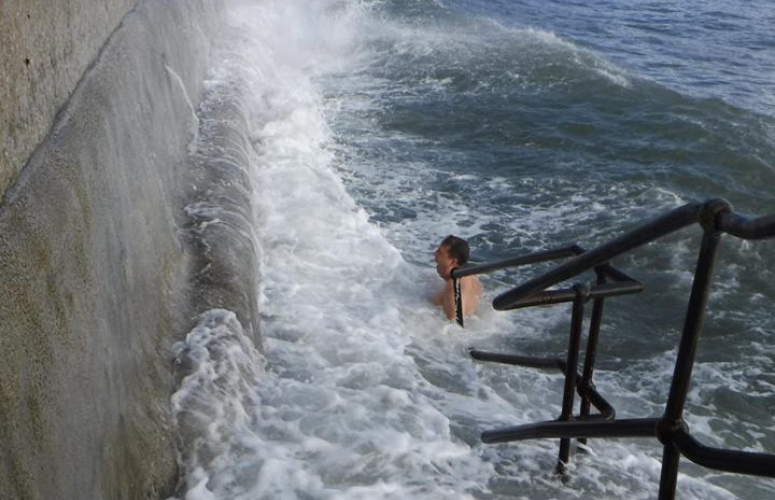 The benefits of this being an ‘urban’ beach also mean there are a few amenities on offer. There is the excellent Meadfoot Cafe open all year round. 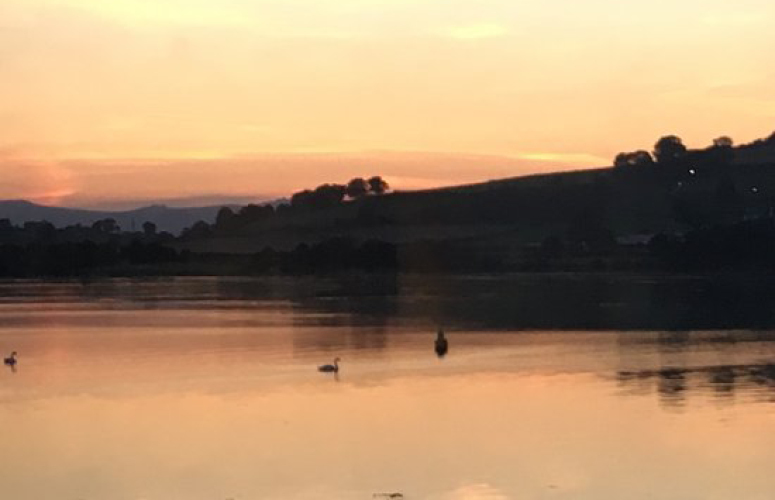 I am keen (almost) all year round open water swimmer and this is a great spot to get in quickly and has a host of landmarks to use as markers for your course. The island about 400 m off the beach is Shag Rock and a swim out around is a regular for the local ‘wild swimmers’. This where the cafe comes into its own as a place for a hot drink and to warm up. Most people associate surf beaches with Cornwall and at a push North Devon. Bantham is no ‘secret spot’ as far as the local population is concerned but doesn’t have the profile of Fistral or Croyde. Located in just west of Salcombe at the mouth of the Avon River estuary is a little bit classic surf and sand dunes coastline. Bantham village is idyllic location and amenities – surf beach, sheltered sandy estuary, sand dunes, expansive sandy beach and lovely local pub are always popular but in the winter there are times when you can have parts of it pretty much to yourself – there i splints of space and hidden places this time of year. 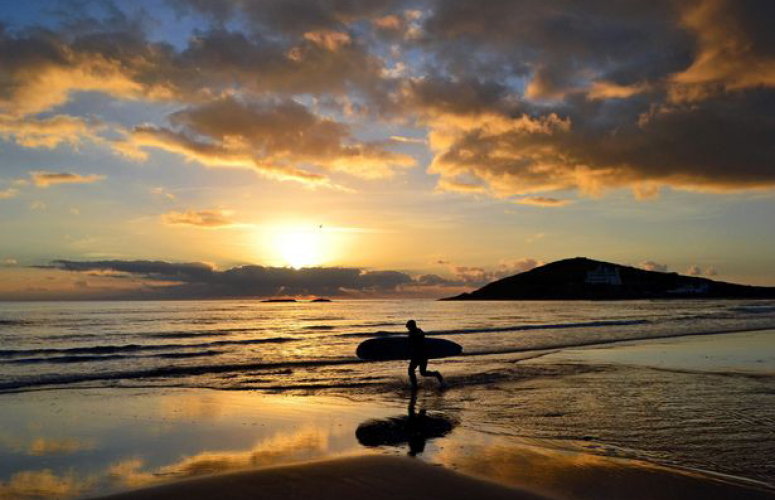 The best two times of the day for Bantham are sunrise and sunset. Sunrise is for the surfers, I will leave it there. As the light fades and sunset begins as a back drop to Burgh Island there is often the most amazing and colourful end to the day. You can then winder back through dunes to the Sloop Inn for a nutty pint of real ale next to a fire.